Cannes 2017 Video #3: "Okja," "The Square," "Jupiter's Moon," "120 Beats Per Minute"
Chaz Ebert reports on "Okja," "The Square," "Jupiter's Moon" and "120 Beats Per Minute" in her third video dispatch from Cannes 2017. Cannes 2017: "Okja," "The Square," "A Man of Integrity"
Reviews from the Cannes Film Festival of Bong Joon Ho's "Okja," Ruben Ostlund's "The Square" and Mohammad Rasoulof's "A Man of Integrity." A film-by-film preview of the 2015 Ebertfest. 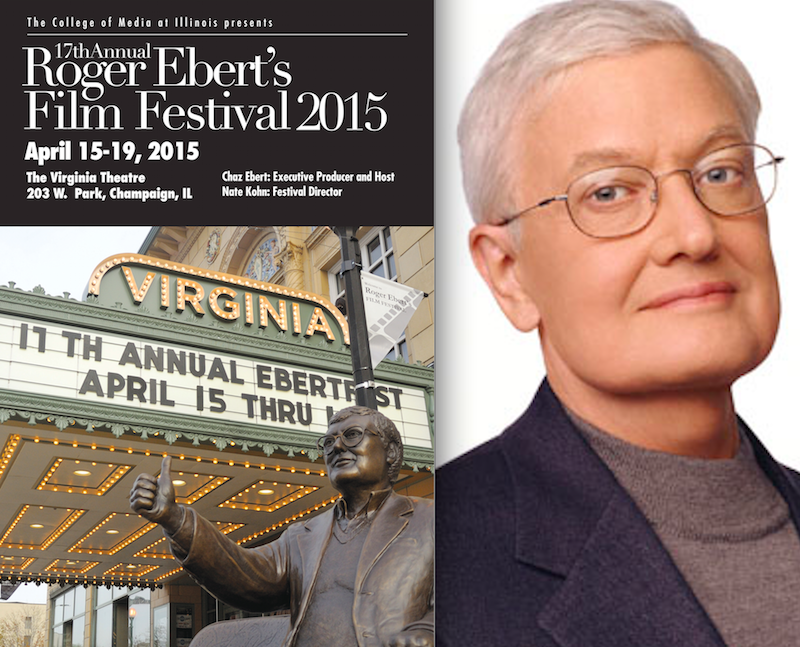 The full schedule for Ebertfest 2015. Ebertfest 2015: Roger, You Would Approve! A preview of Ebertfest 2015. A preview of the 2015 EU Film Festival at the Siskel Film Center in Chicago. A final dispatch with a foreign focus on "Two Days, One Night," "Leviathan," "Haemoo," "A Pigeon Sat on a Branch Reflecting on Existence" and "The Connection." Sheila writes: Who doesn't love a good title sequence? I have my favorites. What are yours? The Art of the Title is a wonderful site that focuses on title sequences and in a recent post Ben Radatz and Bill Perkins write, "There are certain narrative, technical, and graphic techniques for which title design is an ideal venue. Because of its short format and creative license — and sometimes because of their budgets — title sequence real estate is often used to explore elaborate, abstract worlds previously unknown or unseen. For this reason — combined with an enduring human fascination with how things tick — Inner Workings is a theme that is frequented by a broad spectrum of genres (though, to be fair, most often by sci-fi and fantasy)." They break down some of their favorite title sequences, and how the sequences work visually and thematically. Lots of food for thought! Here's the whole post. Enjoy! It's hard to come up with many directors willing to take the leaps of faith that Quentin Tarantino does in every scene of his every movie. It's even harder to come up with any who have the talent to back-up even trying. The biggest reason Tarantino has such a huge following may be how he goes all-out with seemingly little or no concern for crashing -- which, amazingly, he never seems to do. I AM SO PROUD that eight of the Far-Flung Correspondents will be attending Ebertfest 2010, and so sincerely moved that they're providing their own tickets! A shout-out to Ali Arikan, Seoungyong Cho, Weal Khairy, Michael Mirasol, Omar Moore, Omer Mozzafar, Gerardo Valero, and Grace Wang. Only Robert Tan, who has been under the weather, will be missing. They're all bloggers, and will be on a panel Friday morning about the Global Web of Filmlovers. Since Moses brought the tablets down from the mountain, lists have come in tens, not that we couldn't have done with several more commandments. Who says a year has Ten Best Films, anyway? Nobody but readers, editors, and most other movie critics. There was hell to pay last year when I published my list of Twenty Best. You'd have thought I belched at a funeral. So this year I have devoutly limited myself to exactly ten films. CANNES, France -- Why did they save the best for last? "Songs From The Second Floor" and "In The Mood For Love," two brilliant final entries in this year's Cannes Film Festival, played over the weekend, as the hotels were emptying and the traffic jams clearing. CANNES, France -- A Danish film set in America but filmed in Sweden with stars from Iceland, France and the United States won the coveted Palme d'Or here Sunday night, at the 53rd Cannes Film Festival. Lars Von Trier's "Dancer In The Dark" picked up the top prize even though it got the most negative review in the recent history of Variety, the show biz bible. And its star, the Icelandic pop singer Bjork, won as best actress even though von Trier insists she is not an actress at all.